A bottle of the Cortex nootropic stack, 30 COUNT. This is our flagship nootropic stack, that will set the baseline for what nootropics should function like. We built this stack to be a strong, powerful, noticeable nootropic compound that improves verbal fluency, motivation, and mental energy. Smarter Better Faster digital nootropics instruction guide — This is a powerful, downloadable, fully digital nootropics guide that teaches you how to use nootropics surgically, to get the best brain performance results. It teaches you how to stack nootropics, what nootropics to take to reach particular brain states, how to cycle nootropics, and is laden with highly effective lists of nootropic stacks for you to take, that have been tested and work well. It's important to set a precedent and a baseline before you start using nootropics. You need to know what the powerful nootropic stacks do to you, and how to use some of the most widely taken nootropics in the nootropics sphere. 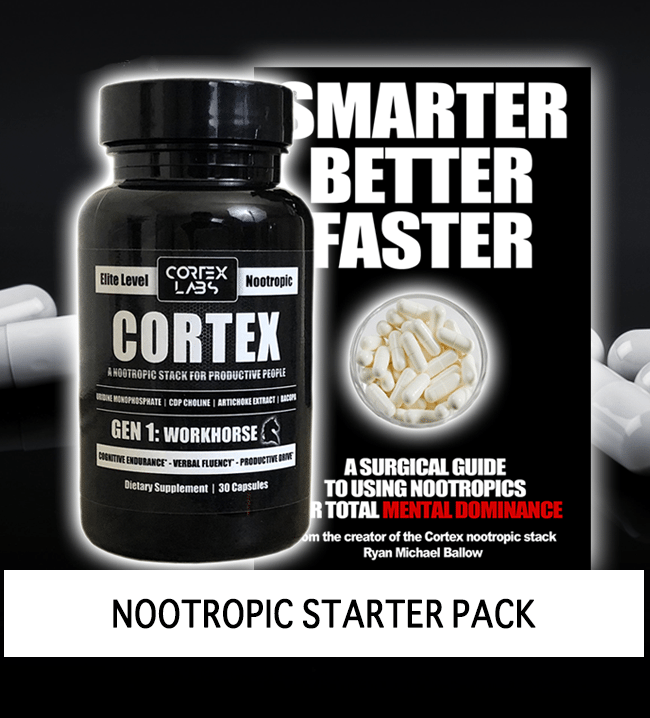 The Cortex stack delivers an example of how a nootropic should feel and function. Our stack is used by everyone from former Army combat soldiers, to high level business people all around the world. Cortex is where you want to start to establish an understanding of what nootropics should be. What neurotransmitters certain nootropics work on. What are the different choline sources? How do you take Racetams? Full breakdown and associated stacks with Noopept. How to use Phenibut, L-Theanine, Ashwagandha, and more. Immediately after checkout, you will receive an email with the attachment for the mobile or computer device you have, to open the Smarter Better Faster digital nootropics guide. Within 24 hours, we will ship you a bottle of the Cortex Nootropic stack. If you're in the US, you'll have it in less than 3 days. If you're outside of the US, you'll have it in 1-10 days. And that's it! The nootropics starter pack is the BEST PLACE to start, in learning, using, and benefitting from the wonderful world of nootropics.